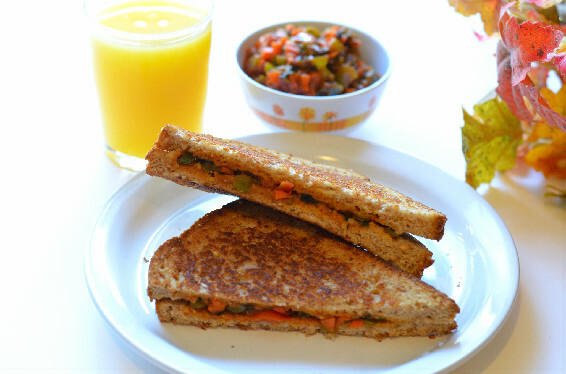 A classic Indian street style spicy sandwich that needs no introduction. 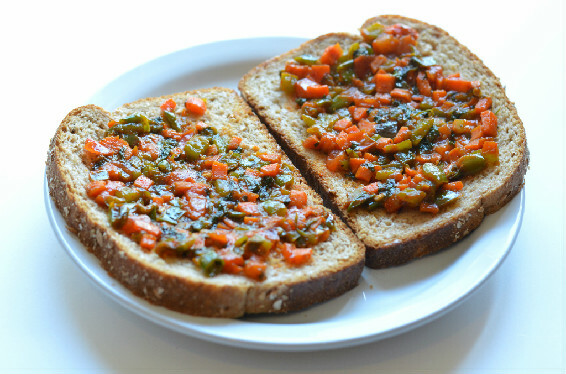 But for those who are not familiar, its a sandwich with a spicy filling made with mixed vegetables and spread on a whole wheat toast. Next time if you want to quick fix a picnic lunch or feed a picky kid try this and you’ll be not be surprised if they ask for another serving. Here’s how I make it…. Note: I used fresh vegetables that I picked from our garden but you are free to add in your own veggies of choice. Add green chillies, chopped onions, salt to taste and fry for 2-3 mts until the onions turn soft on medium flame. Add the carrots, capsicum, and cilantro. Fry for 3-5 mts or until they turn soft on medium flame. Add chopped tomatoes and fry for 2 mts on medium flame. Add red chilli powder, and chaat masala powder. combine. Add the masala chilli sauce and saute for another minute. Turn off the flame and set aside. Heat another non-stick pan on medium. Once hot turn it to a little lower setting than medium. Now assemble the sandwich as follows. Take a slice of bread, and place about 2 tbsps of mixture on one slice. Then top it off with another slice of bread. Place the assembled sandwich on the pan and grill for 2 mts on each side or until the crust is golden brown. Remove and serve with orange juice or cup of soup.